The shamrock, which looks like clover, has 3 leaves per stem. 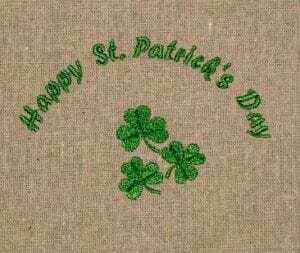 According to legend, Saint Patrick brought religion to the Irish people. He taught them that the shamrock was representative of the Trinity in that there are three diving beings in one God, i.e. the Father, the Son and the Holy Spirit. Although the legend that is told states that St. Patrick drove the snakes from Ireland, in reality, Ireland has no snakes because it is an island, separated from the rest of the continent so the snakes could not get to the island. Therefore, it appears that the analogy of St. Patrick to driving the snakes out of Ireland is a metaphor for St. Patrick bringing Christianity to Ireland and driving out the pagan religions, since many of the pagan religions used serpents as a symbol in their worship. Kalends comes from the word Kalendrium, which means account book in Latin. Therefore, Kalends ( the 1st day of the month) was in Roman times, as it is now, the date on which most bills are due. Nones refers to the 7th day in March, May, July and October and the 5th day in all other months. It was supposed to be the day of the half moon. Ides comes from the Latin word “Idus” and indicated the day that was the approximate middle of the month or the 15th day in March, May, July and October and the 13th day in all other months. As well, the Ides is supposed to be the day of the month on which there is a full moon. Therefore, although it is not widely discussed, the Ides occurs each and every month of the year on either the 15th or 13th day of the month, depending on the month. after all of his reforms, proclaimed himself dictator in perpetuity. A group of senators were not happy with the Caesar dictatorship and wanted to go back to their prior Constitutional government so under the direction of Brutus, they conspired to assassinate the dictator. The assassination took place on the Ides of March. Much to their dismay, their hopes to restore a constitutional government failed because Caesar had instituted too many reforms to undo, the government became too large and instead of returning to the Constitutional government that they killed for, it became the Roman Empire, which ultimately crumbled into ruin. Look out America .History does repeat itself! Beware of the Ides of March has since morphed into a date with a sense of dread or foreboding, since it was the day of the murder of Caesar. Fancy that .the IRS deadline for taxes is near the Ides of April ….What a novel idea!